English bulldogs, like other puppies, experience teething as they grow, and adult teeth begin to come in. The chewing and gnawing behaviors associated with teething often become difficult for owners. No one wants to see their beloved pet in pain, nor do they want that pet to chew on everything in sight. There are several tricks that will help owners treat their English bulldog's teething behavior. English bulldog puppies begin teething at 4 to 5 months of age. Teething behaviors last until adult teeth fully grow in, which is typically about 1 year of age. During teething, these puppies are likely to gnaw and chew at anything. This can be dangerous, if they find toxic things, or damaging, if they chew on furniture, unless their owners give their puppies alternatives. They may also try to nip at hands and feet. 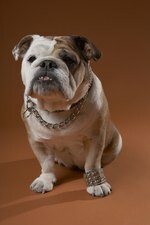 English bulldogs experience pain, especially in the gums, while they are teething. Sometimes bleeding may occur around the gums, but is not a problem unless bleeding doesn't stop or seems excessive. When it doubt, consult a veterinarian. Giving puppies frozen treats helps direct chewing behaviors to something productive and the ice helps soothes gum pain. Homemade frozen treats can include making chicken soup and freezing it into ice cubes, soaking carrots in water and freezing them and soaking a clean rag and freezing it. To help keep puppies from destroying things while you are not home, crate the dog. Give your English bulldog a Kong toy filled with peanut butter or cheese to allow him to gnaw safely in the crate. For puppies that nip at hands and feet, it is important to curb this behavior at an early age. Teach puppies to recognize the command "toy" by saying toy every time you present the puppy with a chew toy. When nipping begins, tuck away hands and say, "Toy," which teaches puppies to go to their toys for chewing, nipping and playing.